We don't often post images of crashes where someone died, but there's a lesson in this tragic crash that claimed two young Australian men earlier today about fast cars, young people and alcohol. 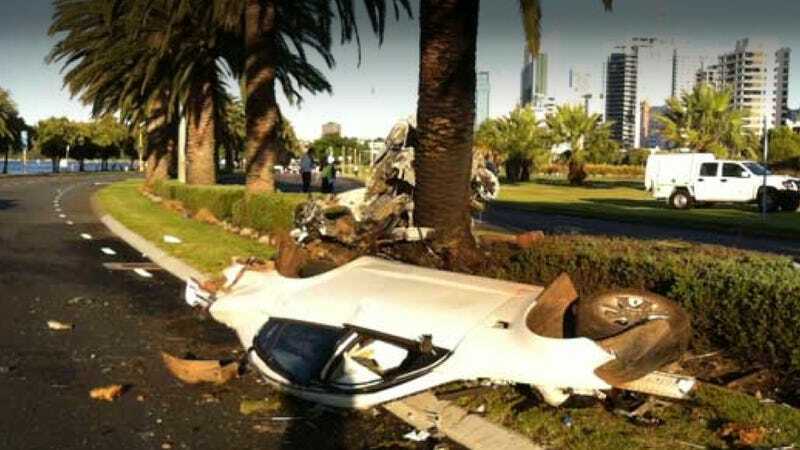 Tom Dymond, a 20-year-old man, and his 19-year-old passenger Shaun Payne were killed when Dymond's VE Holden Commodore sedan slammed into a palm tree at around 1 a.m. today near Perth, Australia. The investigation is still underway, but a senior crash investigator says "obviously speed is a factor… from the vehicle itself speed would appear to be a major factor." Another officer described it as "extremely high speed" and that they suspect "alcohol and/or drugs might have been involved." Even if substances weren't involved, the speed one has to travel to completely sheer the side of a vehicle off must be high. College students returning home from Christmas please try to learn from this tragic mistake and avoid any situations that might result in something like this.